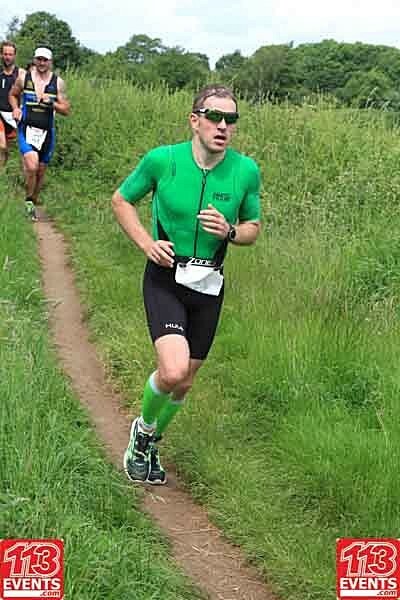 The Cotswold113 was my second middle distance event. I entered this as I have previously marshaled the full event and thus had a free race entry (anyone interested in the same, get in touch with them as they’re always on the look out for marshalls). I’d heard good reports about it and the course fitted in as a ‘mid season’ tester. It’s a pretty flat course, which was something I was after to see what speed I had in my legs for the bike. The run is also very flat, a total of 22m elevation gained according to my Garmin! Given where my running has been recently, I was grateful for this. As regular readers will know I still have calf issues and haven’t run more than 9 miles in a single go since last year. I’ve also only run twice in the last 6 weeks after aggravating the calf problem in Portugal. Registration was the day before which was a bit of a pain as, due to hotel costs, I wasn’t staying over. This meant I had to drive down on the Saturday, but it did give me a chance to see the course marked out and thus drive it. My main observation from this was that it’s not quite as flat as everyone makes out with a short sharp hill half way round the lap, still a total elevation of 341m isn’t that much. Secondly, the road surface was pretty shocking, lots of pot holes, loose gravel and patches of dissimilar tarmac from road repairs. Still, the lake looked lovely and calm and was 20.1 degrees and the run course despite being narrow at times looked nice and firm under foot. As far as ‘not ideal starts’ go, this was up there! I woke up at 3.30am, made up my nutrition, had breakfast and started loading up the car. I’ve recently started using CurraNZ and had been advised to double up on Race Day, so threw those in too! Fingers crossed the lack of muscle fatigue I had experienced in training would manifest in race mode! Then i spot a totally flat front tyre on my bike. Bugger. I’d checked and inflated them the night before so was rather concerned. I figured the best thing to do was to reinflate, take the track pump and reassess when I got there. The next hurdle was that the motorway was closed where I was expecting to join in. There was also a surprising amount of traffic given the time of day on a Sunday! Fortunately I wasn’t too badly affected and had left extra time. What I hadn’t planned for was the huge queue of traffic in to the car park on site. There had been 3 emails telling everyone to have the money ready, but I guess many ignored this. Still, I parked up at 5:10, a bit tight but transition didn’t close until 5:45. First thing to check, front tyre. Gone down again. Bugger. Not knowing the issue I elected to change it however, in my haste I must’ve caught the tube in the tyre as when I went to inflate it, there was a very loud bang – which woke everyone up! Now I had a problem, I only had one tube left, which required the valve extender – the one currently doing its job quite nicely in the rear tyre. Note to self, get a spare valve extender…. I then took a calculated guess (hope!) that the problem with the first tube was a leaky valve. Valve from tube 2, into tube 1… cross fingers. By this time it was also 5:45…. a very helpful car park official offered to go and let them know at transition that I was having issues! Thank you, whoever you were! With everything eventually sorted I dashed for transition and got racked, leaving my drink in the car. During racking, my stomach decided to inform me of some mild issues, next port of call, the loo! 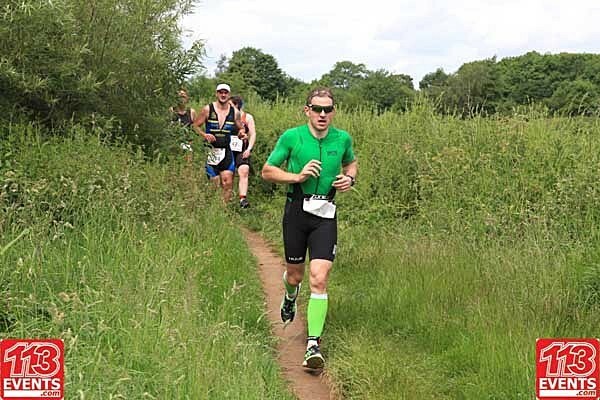 I dashed out of transition just as the race started and joined a very long queue for the toilets, not ideal but I had 40 minutes until I needed to be at the waters edge. Calm eventually ensued, I headed back to the car, to get my wetsuit on. On the way I spotted a number of people wearing the new Zone 3 Aspire Ltd Edition – jealous much!? It looks awesome…. mine felt decidedly ordinary! I’d been thinking about upgrading to the Vanquish anyway – snazzy looking or better suit, tough one!? I drank as much High5 EnergySource as I could and threw a gel in for good measure as I clearly hadn’t taken enough on board. Then I made my way to the race start and tried to compose myself. After a quick race briefing we were allowed in to the water 5 minutes before the start to acclimatise and warm up. Then a 1 minute count down… I had positioned myself away from the bulk of people on the left hand side, giving myself the straightest line to the first buoy. However it was still a bit of a scrum at the first turn. 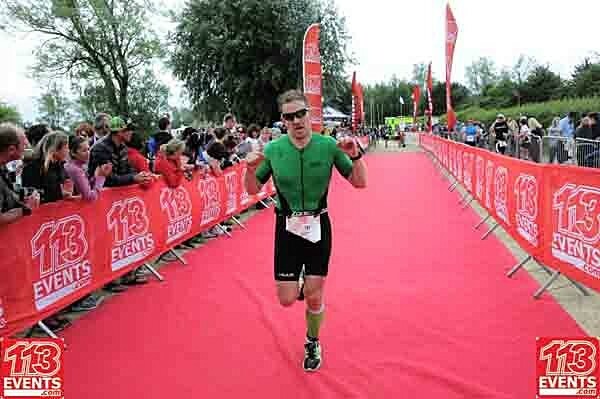 I had gone out hard, but not too crazy, with the intention of building to a strong finish. The plan was going well and I settled in to a strong rhythm and was picking people off nicely. Sadly I was unable to find any decent feet to swim off. I was swimming parallel to one guy who was adamant I wasn’t getting past as he surged every time I tried to break clear. To make matters worse my goggles were starting to fog up. At the second buoy we turned and I found a foot in my face, knocking my goggles clean off my head. Thankfully they didn’t disappear completely but it took a moment to get them back on and then notice that the culprit was ‘already known to me’. The time cost wasn’t too bad, but from this point on the goggles situation just got worse. I had to stop twice to remove them and rinse them with water. Frustrating but I tried not to let it get to me. Towards the middle of the swim I started to catch the slower swimmers from the wave ahead. One of whom was doing backstroke. Who does backstroke in a race!? Despite the time taken to pass people it helped with sighting and also gave me targets to pick off one by one. In the last third I started to push harder as any concerns of breathing issues had all settled by now. I was passing people readily now, many with blue hats (my wave) who’d clearly gone out too hard. The cheers that could be heard from the crowd were an added incentive too. I saw dry land and grabbed an arm to pull me out the water. Hit lap on my Garmin and then swore. 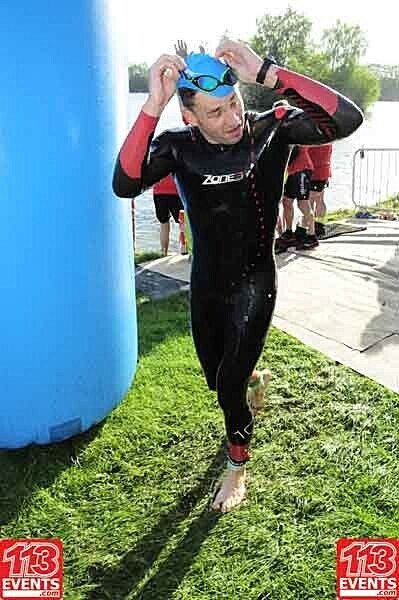 Despite it being a PB swim by over 5 minutes I was more irritated that I’d missed going sub 30 minutes by 22 seconds! 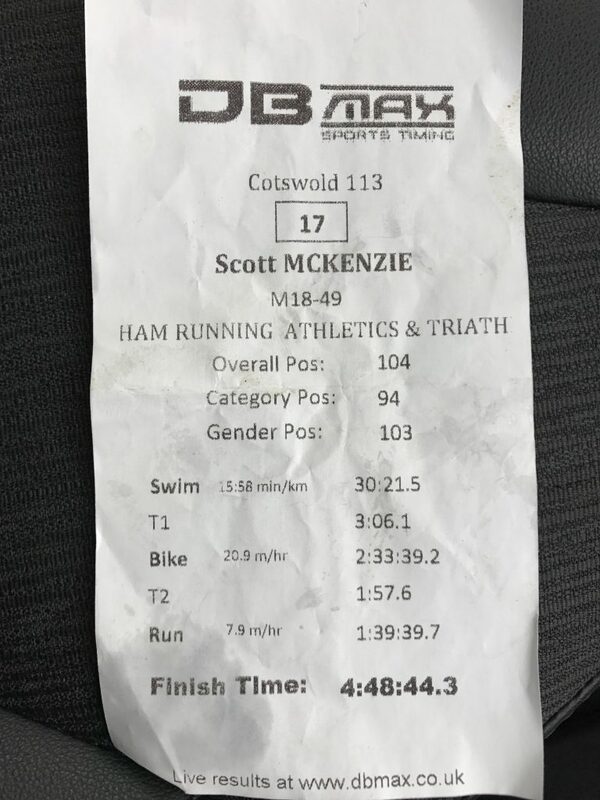 I was pretty pleased with my transition time given how the day had gone and the distances I had to run between swim, rack and bike start. I threw a caffeine gel down in T1, based on advice from High5 and Lucy Gossage. The anger at missing the swim time gave me plenty of encouragement and I swore at a friend, Kerry, as I went past her! At the bike mount line I managed to kick my water bottle out of the rear cage, not ideal. 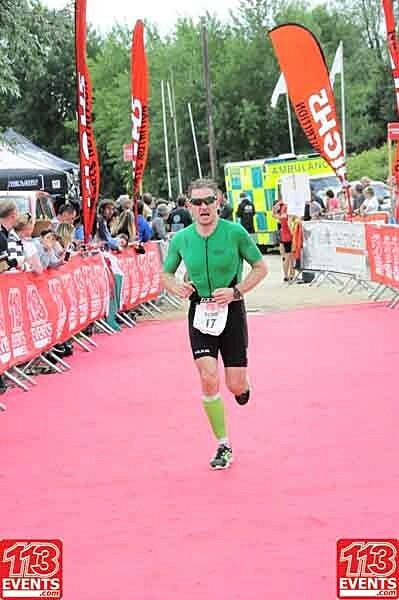 Fortunately it didn’t cost me too much time to stop and collect it.
.@srbmckenzie @HUUBDesign @UkTriChat You can’t imagine just how much faster you’ll go! Good luck in your next #triathlon ! 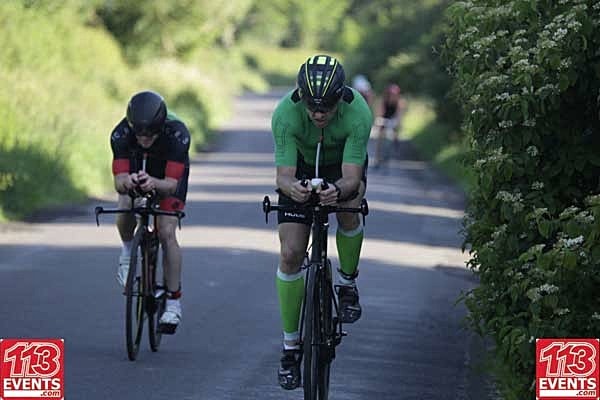 The bike course was a 2 lap affair and having driven it the day before was fairly flat but notably had a pretty poor road surface, with pot holes, loose gravel and uneven tarmac to contend with. 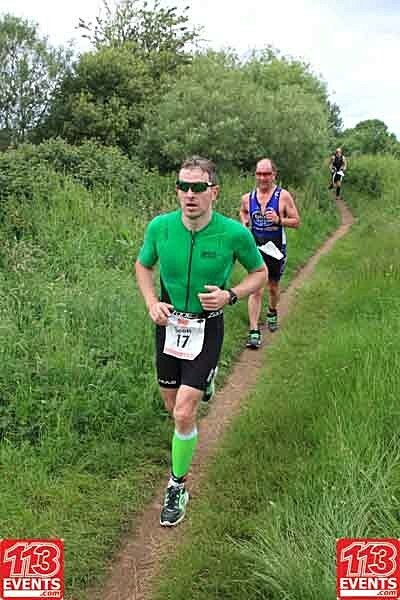 There were 2 hills, one reasonably short but fairly steep and these were both about half way round the course. 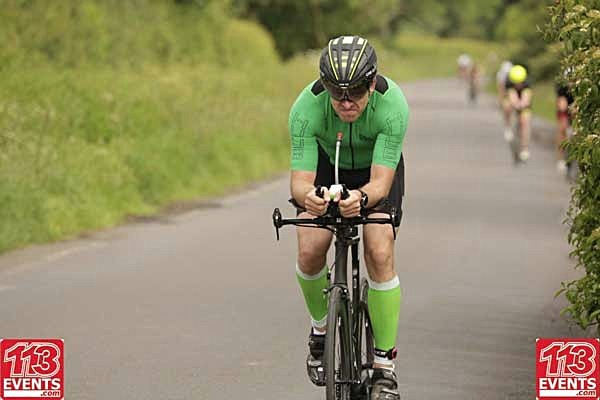 As I set off, I passed a number of people on the other side of the road who were just coming in to start their second lap from the early waves – clearly they were quite quick! The first part of the course was on fairly wide roads but unfortunately this also meant cars. 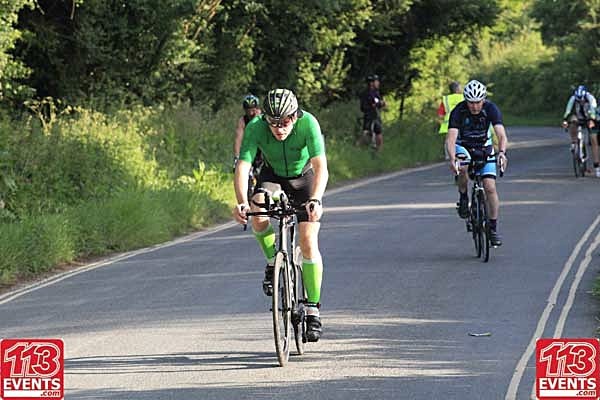 Throughout the course I probably overtook 10 cars; I appreciate that they were waiting behind cyclists to overtake safely but they were holding me up! Where the loops started on the bike, the road surface was the worst, but thankfully this was also where the roads were narrower and thus less busy with cars. The plan for the bike was to set off steady to let my HR drop into the target Z3. This settled down quite quickly and whilst coach had told me not to bother with power or speed I had elected to use my Garmin Edge 820 after not doing so in Staffs and paying the price! As a result, my HR came into target quite quickly and I noted that my power numbers were pretty steady and my speed was too; all good. I was averaging around 22 miles per hour which surprised me as throughout my training rides I had felt like I was struggling to maintain this sort of speed. Cotswold113 2017 Bike – POWWWER! I stuck religiously to my nutrition plan and had once again elected to be self sustained so had my BTA bottle, a large spare behind the saddle and an aero bottle just in case. All were filled with High5 EnergySource, my new favourite energy drink (it’s very light in taste and not too sickly). I also had another favourite thing, a High5 Gel Flask, filled with Raspberry EnergyGel Plus – a caffeinated gel. 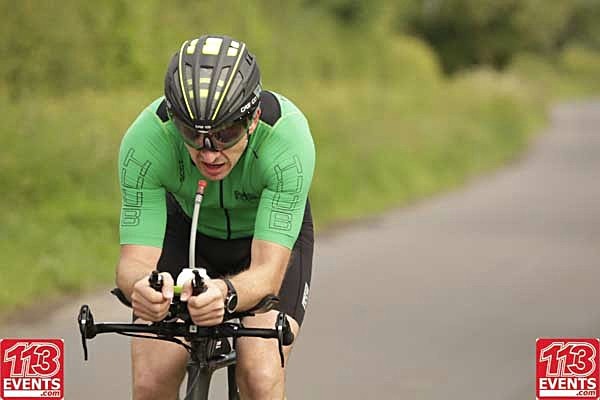 The flask is a thing of beauty, it fits 5 gels and is super squishy thus making it really easy to take ‘a gel’ quickly and easily without battling to open a wrapper whilst trying to remain aero. Buy one! 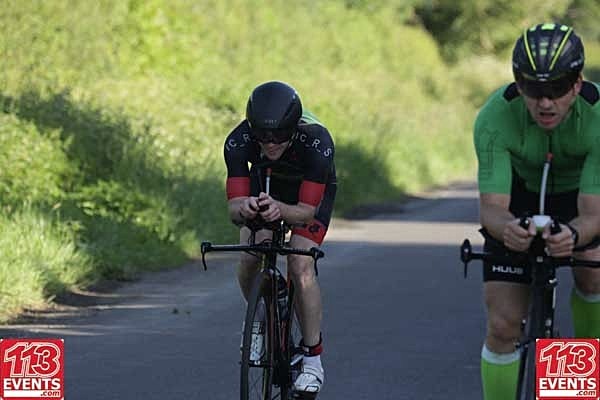 I stuck to my own race on the bike, I was going at around the same pace as a couple of people early on in the bike and we were all passing others readily. Thankfully there were no crazy cyclists to contend with, making it a relatively uneventful first lap! Given how flat the course was it meant very little rest from pedalling and I was almost pleased to see the hill. My average speed dropped quite markedly though but the change in cadence on the up and down gave my legs a bit of a break. One of our trio dropped like a stone on the hill and was never seen again. Making my way to the turnaround was good, although I got stopped at a junction by the police only to be nearly knocked off my bike by a guy who went sailing past me and the office, barely acknowledging what he had done! 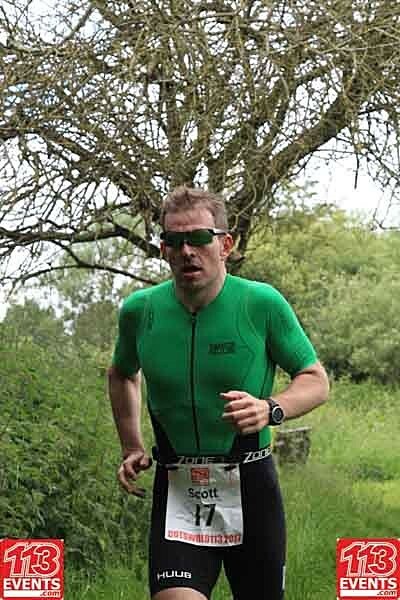 At the start of the second lap I took a moment to mentally assess how things were going; really good. All the numbers still stacked up, my legs felt good and I was familiar with the course now. I was really pleased with the High5 nutrition too. I’ve tried a few drinks/gels over the years but these are so light in taste and texture it was great! The Gel Flask was making taking the gels so much easier too. I said it before, but I’ll say it again – buy one!! I got passed by a couple of serious folks on Lap 2, pointy helmets, seriously aero, disc wheels… that sort of thing. 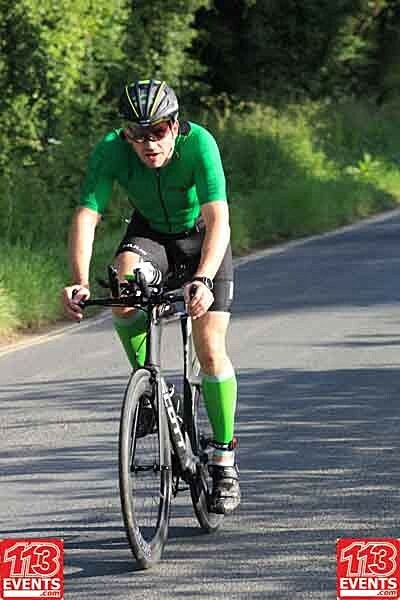 Serious bike envy as a guy went by me like I was stationary on a Scott Plasma 5 with Lightweight wheels and disc on…. that was the last I saw of him! Overall though I think i was passed by around 6 people in total which pleased me greatly. During Lap 2 I noticed that my HR was starting to drop into high Z2 rather than Z3. The power and speed numbers were steady though. Slightly ignoring coach’s advice I decided to go with it and not push harder. I felt good but didn’t want to risk killing my legs for the run. Maybe those #magicberries were doing their thing!? 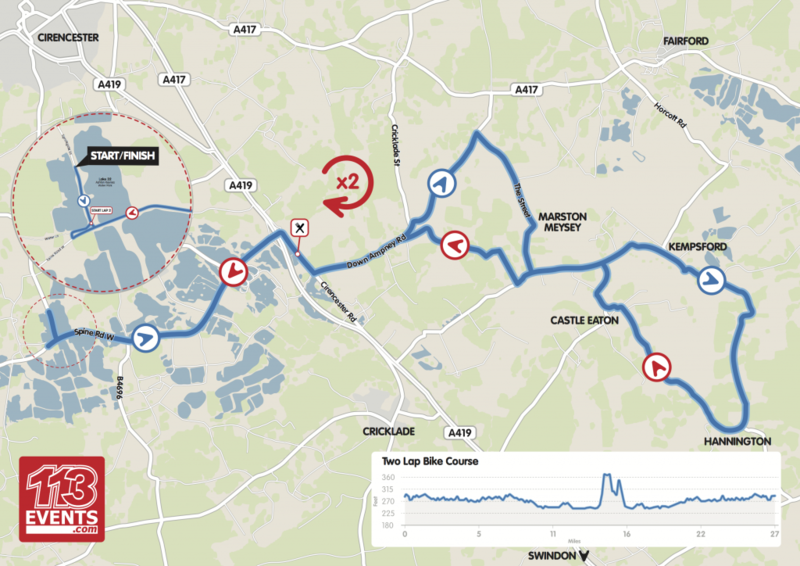 T2 was fairly speedy, a short run back to park my bike, another gel down me, running shoes on and on our way! The run course was also very flat, but was on mixed terrain, from grass, to sand, to gravel and finally tarmac. The most frustrating part was that it was very narrow in places, meaning that passing was nigh on impossible unless you fancied some stinging nettles! In some ways this was a positive as it encouraged you to push before you got to a narrow part if you needed to pass someone. 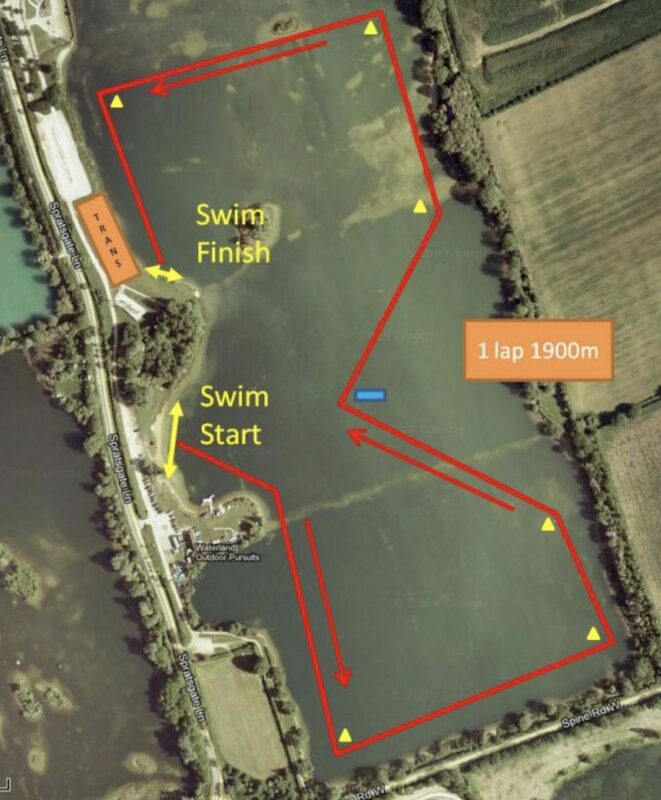 This was another multi lap course which followed around the lake that we’d swum in and then did a loop out on to cross the bike course (not a good idea!) 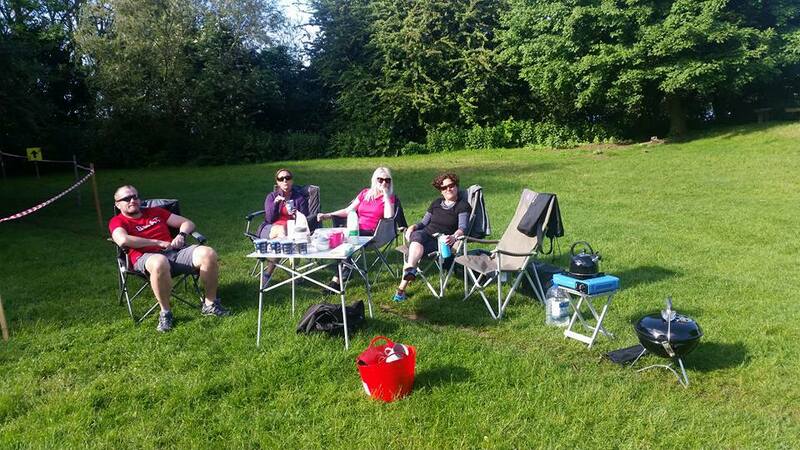 before heading through a small country park and then a housing estate then back to the transition area again. The run was the area I was most concerned by, as I’ve already mentioned I hadn’t run more than 8 miles so was concerned where I would be. I was mentally focussed on the time in my head, I already knew my aggregate time and was aware that I needed to do a sub 1:52 for the half marathon in order to hit my target time. 8 min miles was the target. As it was, I started out steadily and was averaging 7:30min/mile for the first 6-7 miles, I was running ok but a tightness in my back and hip that I had felt in training during the week was omnipresent. I was able to run through the discomfort but never truly hit a rhythm. I was passing people and being passed but I was making good progress. I couldn’t get my HR where I wanted it to be but just went as well as I could. About miles 9 things started to get tough and my run splits started to slow. Seeing an 8 at the beginning of a mile split wasn’t good. However, there was an awesome support crew 1 mile after the start who had been cheering emphatically every time I had passed, this gave me something to aim for! Once I was passed them, it was sheer determination that was going to get me home. 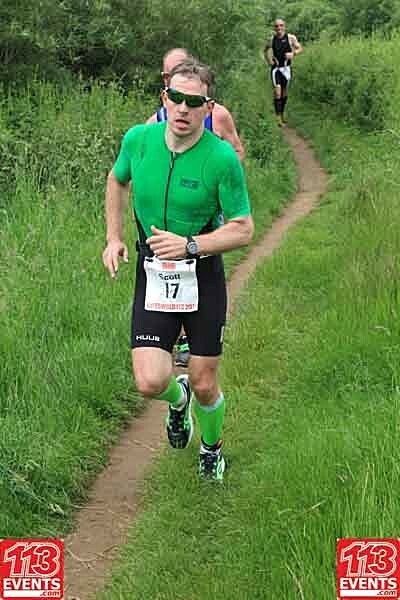 I pushed through the pain, and whilst it didn’t look pretty we were still moving and the pace picked up again. With a mile to go, I gave whatever I felt I had left in my legs, it wasn’t much but I was determined to give as much as I could. Crossing the line I was elated. Not only had I set a new PB for the Half Marathon by 9 minutes, I had gone and smashed my target time by a full 12! I’ll take that! The aim I set myself at the start of the season, before any injuries, was a sub 5. Given everything that has happened I am over the moon. Not only did I achieve my goal, I took a full 40 minutes off my PB. 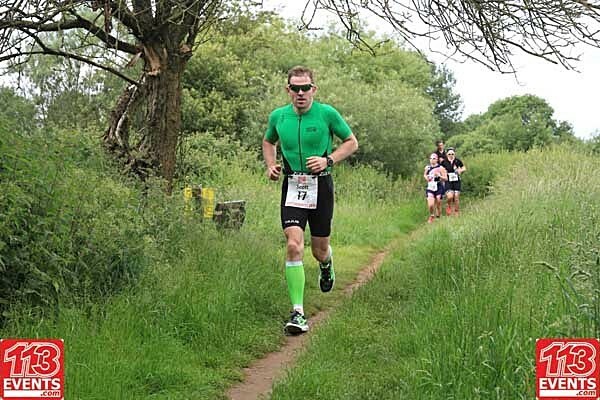 Admittedly my PB is from my one prior race at Ironman 70.3 Staffordshire and that was different in every way, but it’s still a massive achievement that I’m really happy with. Equally, I set a new PB in every discipline by at least 5 minutes! When you embark on a journey with a coach you don’t know if it will work out. I’d had question marks in my mind about where my cycling was at. I knew my running was off too. This result solidifies it for me. It’s hard work, but it’s absolutely the right thing! Thanks Steve, I genuinely couldn’t have done it without you… here’s to the next goal! As for the race, I highly recommend it. The bike course is a bit tricky in places but the event is brilliant fun. The marshals are friendly. It’s really well organised! I’d add it to a list of recommended races to do, if I had one!